The logistical steps that guide you over time is what the planning journey embodies. Knowing your likes, style, personality and wedding needs carves out the course. 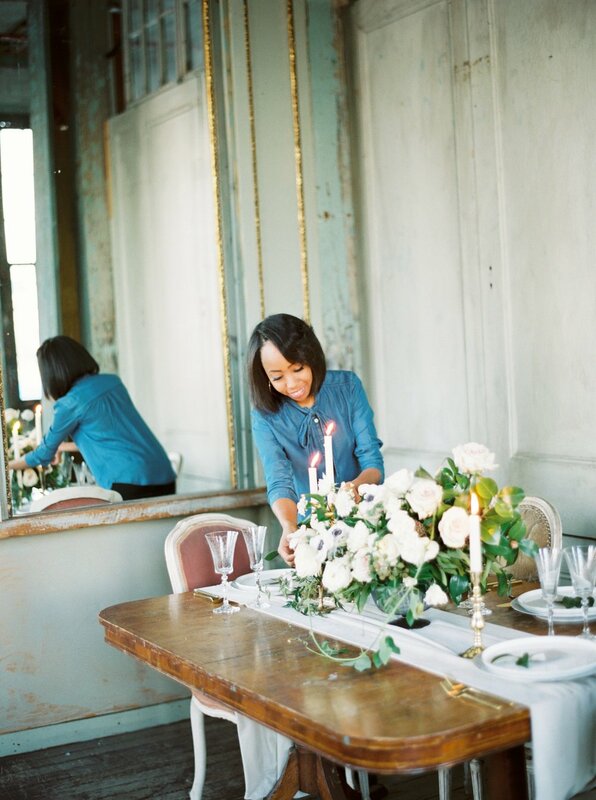 From budgeting your wishlist, pairing the best team of vendors, venue touring for the perfect place, detailing the timeline moment by moment to even advising on wedding etiquette when family dynamics are unique. On the day of the wedding, we're the first to arrive and the last to leave all to ensure a joyous and peaceful experience start to finish. All in all, we start with a vision cast. Whether you start with one piece that you love or maybe you see the overall remarkable picture, I bring it to fruition by filling in the space with the makings of a timeless event. A wedding should be inviting in atmosphere and cohesive in motif with all the moving parts singing the same song as the couple it's written for. Creating a beautifully balanced color story, adding layers of intrigue to the design, mixing textures and playing with room symmetry are some of my methods that lead to a remarkably well put-together affair. One that you and your guests will remember...for all the right reasons. Ever see those images of artfully displayed paper suites mixed with blooms, soft ribbons delicately cupped around the boutonnieres or the bouquet sitting pretty in a vintage chair? These are day-of styling features included with every wedding. Highlighting their character in a way that shows the style of the day are some of my favorite ways to capture what you hold dear in the details. *I celebrate love and life in multiple facets. The offerings above are also extended to surprise proposals, elopements, engagement sessions, vow renewals, lifestyle shoots, editorials and workshops in small quantities per calendar year. Inquire by email for details.